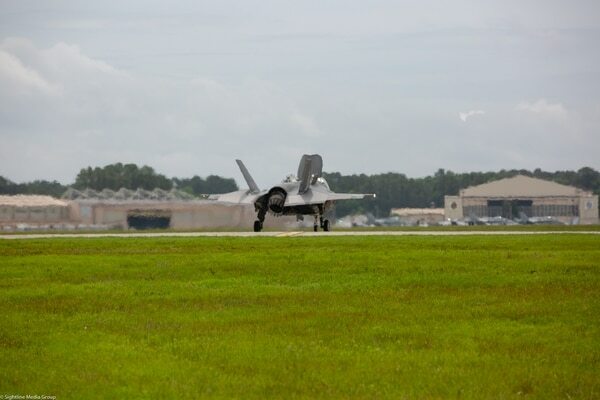 MARINE CORPS AIR STATION BEAUFORT, S.C. — The Marine Corps’ premier F-35 training squadron is churning out new pilots, but low availability of spare parts and the jet’s logistics system continue to cause a headache for the maintainers at Marine Corps Air Station Beaufort. MCAS Beaufort in South Carolina is home to Marine Fighter Attack Training Squadron (VMFAT) 501, the service’s hub for pilots learning to fly the short takeoff, vertical landing F-35B variant. But when Defense News visited the base on May 17, maintainers at the base echoed concerns heard around the F-35 enterprise: As home to some of the military’s oldest F-35s, aircraft availability is suffering as planes sit waiting for spare parts and for key hardware and software modifications. Marine Fighter Attack Squadron 122 out of Yuma, Arizona, conducted its first flight operations with the F-35B Lightning II. Beaufort isn’t the only base impacted by the spare parts shortage; the problem reaches all the way across the F-35 enterprise. Due to a lack of parts available, F-35s worldwide were unable to fly about 22 percent of the time from January 2017 through Aug. 7, 2017, the Government Accountability Office reported in 2017. A Lockheed Martin team recently visited MCAS Beaufort and spoke with pilots, maintainers and base leadership on how it could help Marines get spare parts quicker and discuss other sustainment problems, Lockheed spokesman Mike Friedman told Defense News in a statement. Some of the actions the company is taking to address concerns about long waits for spares include: pre-funding spares before a contract is awarded; working with suppliers to improve the reliability and availability of key parts; and ramping up both industry and government’s ability to repair parts. The company also wants to explore options for using 3D printed parts, which can be made rapidly when old parts break, Friedman said. Thirty F-35Bs are based at Beaufort: 11 jets belonging to the U.K. Royal Air Force and 19 U.S. Marine Corps planes. Those aircraft run the gamut from those equipped with the 2B software — an early version with a restricted flight envelope and weapons carrying capability, ones with improved 3I software that the Air Force used when it declared its jets operational in 2016, and the final 3F software that allows for full warfighting capability. The Pentagon is preparing new ways to drive costs down on the F-35 sustainment. All of the F-35s at Beaufort will eventually be brought up to the 3F standard, but doing the software and hardware modifications necessary to turn an early version of the jet into a fully-capable version takes time and a toll on the squadron’s aircraft availability. On any given day, there are several aircraft undergoing modifications either at Beaufort or the Fleet Readiness Center at Marine Corps Air Station Cherry Point in North Carolina, said Maj. Andrew, VMFAT-501’s assistant operations officer. Headquarters Marine Corps in the Pentagon and leaders at Beaufort refused to comment on the average number of planes ready to fly at Beaufort, citing 2017 memos by Defense Secretary Jim Mattis urging Defense Department personnel to be cautious about divulging information related to readiness. “We are unable to provide readiness rates or the number of available aircraft for any platform and especially for a specific squadron due to operational security concerns and per the guidance of Secretary Mattis,” Marine Corps spokeswoman Capt. Sarah Mobilio stated. However, the base has had one of the lowest availability rates across the F-35 enterprise. In fiscal year 2017, Beaufort’s 28 F-35B aircraft accumulated a dismal 38 percent average availability rate, meaning that only one third of the base’s B models were ready to go at a given time, according to data published in a 2018 report by the Pentagon’s director of operational test and evaluation. Only the F-35Bs undergoing tests at Edwards Air Force Base posted a lower rate, at 35 percent. While having older F-35s may cause some issues on the maintenance side, it doesn’t affect pilot training at all, said Lt. Col. Adam Levine, who commands VMFAT-501. As of May 24, the squadron has completed training of 16 F-35B pilots over the course of fiscal year 2018, Mobilio said. ALIS, the F-35’s logistics system, has been slammed by F-35 critics for being overly burdensome and requiring its users to often work around the system’s limitations. As the software improves, maintainers are noting better performance, but say it still needs improvement. F-35B Joint Strike Fighters based at Yuma Air Station in Arizona have been temporarily grounded due to issues with a key support system. “It’s slow,” Pedro said, and that may be a problem specific to Beaufort, as Marines at MCAS Yuma in Arizona are reportedly experiencing faster ALIS response times. Another maintainer told Defense News that ALIS’ 2.0.2 software update, a version of which is used at Beaufort, is helping speed up engine maintenance. ALIS 2.0.2 marked the first time the F-35’s Pratt & Whitney F135 engine was fully integrated with the system, allowing it to pull data from the F135 and run diagnostics. However, a number of workarounds are still needed, for instance, when that data does not import correctly, the maintainer said.